The Republic Act No. 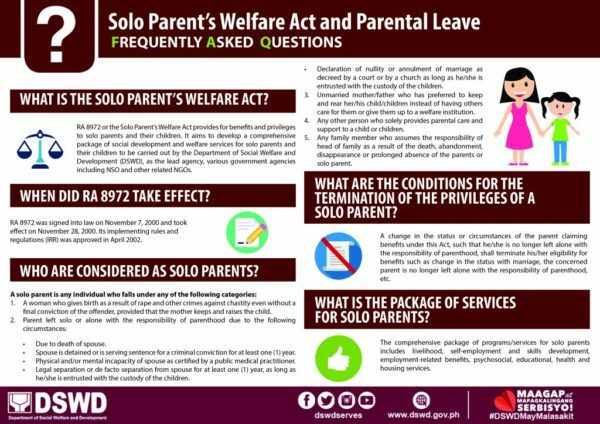 8972, or the Solo Parent’s Welfare Act, defines solo parents as those who are left alone with the responsibility of parenthood due to death or mental incapacity of the spouse, legal separation, or annulment of marriage. They could also be an unmarried mother or father who preferred to keep and take care of his or her child/children. Furthermore, any family member who assumes the responsibilities of the head of the family as a result of the absence of their parents is also considered as a solo parent. The same is true for any person who solely provides parental care and support to a child or children. As such, those who are considered as a solo parent are provided with a package of programs and services from the government such as livelihood, self-employment, and skills development, employment-related benefits, psychosocial, educational, health and housing services. Employees who fall under the category of a solo parent are also granted with a seven-day parental leave every year, provided that they have rendered at least one year of service. These leave privileges may be used by the solo parent to attend to personal milestones of the child; to perform parental obligations; to attend to medical, social, spiritual, and recreational needs of the child; and other similar circumstances where the physical presence of the parent is required. 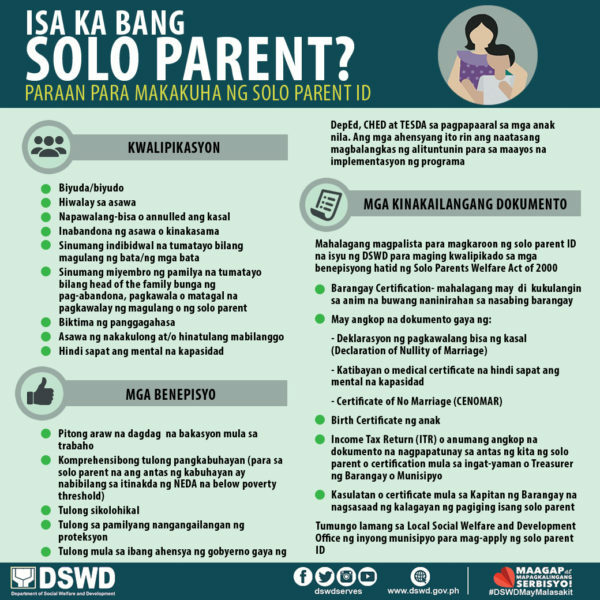 To avail of these programs and services, one has to secure a Solo Parent ID. An applicant for a Solo Parent ID may proceed to the City of Municipal Social Welfare and Development Office under his or her local government unit. Income tax return or any document that establishes the income level of the solo parent. The social worker who will receive and ensure that all documents are complete. The solo parent ID will be issued 30 days from the date of filing. It is valid for one year and is renewable. 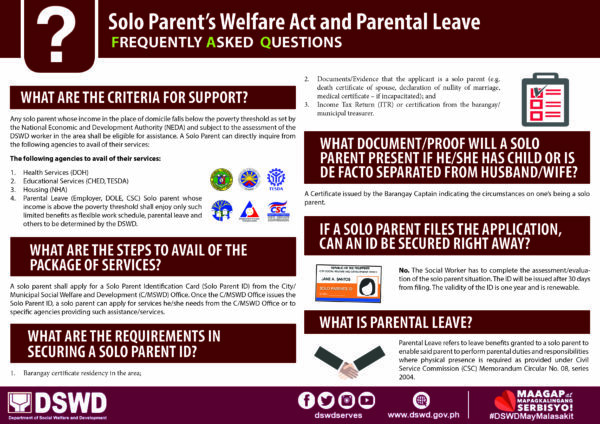 For more details about the programs and services for the solo parent, please visit DSWD website at www.dswd.gov.ph.